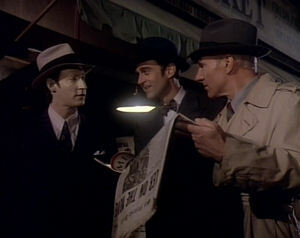 Captain Picard and others get trapped in the middle of a hard-boiled detective story on the holodeck. This is one of those episodes where you can tell the cast is having a good time. That makes it fun, even when it's at its cheesiest. Right from the start, it invites you to not take anything that happens seriously. The episode is titled "The Big Goodbye," which sounds an awful lot like The Big Sleep meets The Long Goodbye. The lipstick is a nice touch, but shouldn't it vanish once Picard leaves the holodeck? Come to think of it, there was a similar problem in "Encounter at Farpoint," when Wesley walked out of the holodeck soaking wet; he should have dried off in the hallway. I like when Picard, all giddy, asks Crusher to go with him into the holodeck. She thinks he's essentially asking her out on a date, but then Picard, totally oblivious to this, starts talking about everybody else he wants to invite. Then he talks about kissing a holographic woman, and you can almost see the steam coming out of Crusher's ears. I also like how they leave it up to your imagination how the Jarada would react if Picard offends them. Data's gumshoe accent is great. There's lots of neat little touches to remind us of the anachronisms, like Crusher swallowing the chewing gum or Data not understanding that the lamp is plugged into the wall. The writers obviously aren't trying to hide the parallels between Dixon Hill and Sam Spade, specifically the film version of The Maltese Falcon, though Redblock is more Marlon Brando than Sydney Greenstreet. The Jaradan sounds like Janeway to me. This episode touches on some philosophical questions about the nature of reality on the holodeck that continue to be explored all the way through VOY, though they never really get resolved.